Your inquiry has been forwarded to Behr's Funeral Home. Sister Margaret Mary "Peggy" Griffin, OP (Marie Annette), 89, was called home on June 8, 2016, at St. Dominic Villa. To honor Sister Peggy's life, a Mass of Christian burial will take place at 10:30 a.m. Tuesday, June 14, at the Gathering Place chapel, Sinsinawa, followed by burial in the Motherhouse cemetery. 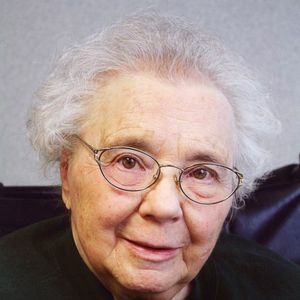 To celebrate Sr. Peggy's life, friends may call after 5:15 p.m., Monday, June 13, at the Motherhouse, where a wake and remembering service will be held at 6:30 p.m. Behr Funeral Home, 1491 Main Street, Dubuque, is in charge of arrangements. Sister Peggy served in a variety of ministries. She taught kindergarten and junior high and also served the Sinsinawa Dominican congregation as vicaress provincial and researcher of the Southwest Province. She later served as liturgist and assistant to the local prioress in Spokane, Washington. Sister Peggy was a pastoral minister in Bolivia and Alaska. She volunteered at the Motherhouse and enriched community life. Her other ministries took her to Minnesota, Illinois, Montana, Wisconsin, California, New Mexico, and Idaho. Sister Peggy, born January 16, 1927, in Sioux City, Iowa, to James and Margaret (Duhaime) Griffin, made her profession Aug. 30, 1948. She is survived by a brother, Thomas; nieces; nephews; and the Sinsinawa Dominica Sisters with whom she shared life for 67 years. peg gave her life to the Dominican Order, but in return she had a wonderful life, full of challenges and satisfactions. I don't think she would have had it any other way.